When you stop and think about how important your heating and air conditioning systems are to your home’s comfort, it becomes easier to understand why you should call a professional contractor for any services that you need. Quality Air Heating and Air Conditioning offers comprehensive heating and air conditioning service in Brice, OH for many different types and brands of systems. If you need repairs, we’re available 24/7 for emergency heating and air conditioning repair in Brice, OH. For new installation projects, our technicians can recommend a system for you that fits your needs and your budget. We also offer an outstanding maintenance program that includes many perks for our members like discounted rated and extended warranties. Call us today to learn more. Do you need any heating service in Brice, OH? While there are many different contractors out there, only Quality Air Heating and Air Conditioning offers the dedicated service and high quality workmanship that you can count on. If you need a new system installed in your home leave it to our highly trained experts to find a new system for your home and then install it quickly and properly so that you can enjoy years of comfortable heating. For repair, our specialists can work on a wide variety of heating systems including furnaces, heat pumps, ductless mini split heating systems, geothermal units and much more. Call today to talk with us. Heating problems should never be taken lightly. Not only can heating issues impact your comfort, but some of these issues can affect your safety as well. Quality Air Heating and Air Conditioning offers 24/7 heating repair in Brice, OH and our experts can repair any problem that you’re having. We understand how important your comfort is to your home and our technicians take great care to provide you with top quality service on every single job. Having a new heating system installed in your home is a big project and one that must be done by a professional. Without the help of a trained specialist, you simply cannot expect your new system to operate up to standards. Quality Air Heating and Air Conditioning offers heating installation in Brice, OH and we do more than just install your new system and then leave. We can help you through the whole process, make sure that your new heater is the right size and that it is installed and operating safely. Call us today to talk with one of our friendly Brice, OH heating installation experts. When the weather starts to warm up make sure that your AC has what it takes to keep your home nice and cool. Quality Air Heating and Air Conditioning provides air conditioning service in Brice, OH for all types of systems. Whether you need new isn’t for a heat pump or if you central AC system is blowing warm air, give us a call. We’re available 24/7 for emergency air conditioning repair in Brice, OH and for new installation we’ll work with you through the whole process to make sure that your new air conditioner operates as it should. Call us today and one of our Brice, OH air conditioning experts can answer any questions that you have. Don’t wait to call for service when you notice problems with your AC. This will only allow the problem to get worse. Call Quality Air Heating and Air Conditioning for air conditioning repair in Brice, OH. We always have a live person ready to pick up so even if your system breaks down in the middle of a hot night, you’ll get service from us. We can work on any kind of AC that you have, so call us today if your air conditioner is making an unusual noise, producing a strange odor, or not producing enough cooling. Having a new air conditioning system installed in your home is a big job that requires the skill, training and experience of an air conditioning expert. Quality Air Heating and Air Conditioning offers quality air conditioning installation in Brice, OH. We often get calls to repair air conditioning systems that break down because of poor installation. Don’t let your home’s comfort or efficiency suffer because a non-professional installed your air conditioning unit. Call Quality Air Heating and Air Conditioning today. Too often we encounter homeowners whose AC system is operating inefficiently or is experiencing more repair needs because of a lack of maintenance. Quality Air Heating and Air Conditioning provides total air conditioning maintenance in Brice, OH for all types of systems. Our maintenance program includes all kinds of perks for our members including reduced pricing, regular tune-ups, priority service and extended warranties. Call us today to find out more about the terrific benefits of air conditioning maintenance. When your air conditioning system comes to the end of its life, make sure that you work with the technicians at Quality Air Heating and Air Conditioning your air conditioning replacement in Brice, OH. We will handle the whole process and make sure that you get a new AC system that fits your home’s size and your budget. If you’re interested in switching to a different type of air conditioner, we can talk with you about that and the other options on the market. Call today! Don’t compromise your business with less-than-stellar HVAC service. Quality Air Heating and Air Conditioning is the company to call when you need any kind of commercial HVAC service in Brice, OH. From maintenance and installation to repair and replacement, our experts can handle any job, large or small. If you aren’t getting enough heating or cooling, or if your system is making a new noise that you’ve never heard before, call us 24/7 for commercial HVAC repair in Brice, OH. For new installation, we can install all types of commercial HVAC equipment including cooling towers, chillers, and much more. Sometimes your HVAC system can break down unexpectedly, so you need an HVAC contractor that is available at all times. Quality Air Heating and Air Conditioning proudly offers 24/7 emergency commercial HVAC repair in Brice, OH for all types of businesses. Our experts have worked with countless commercial customers and know exactly how important the comfort of your business is to your success. We’ll work hard to get your HVAC system back up and working again and with the high quality of service that you deserve. Are you ready to replace your current HVAC system with a newer, more efficient model? 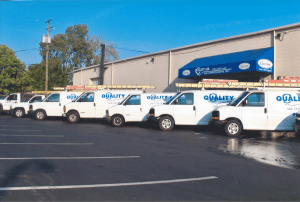 Call Quality Air Heating and Air Conditioning for commercial HVAC installation. We can talk with you about the size and layout of your business and come up with a terrific system that will fit your needs as well as your budget. Give us a call for all your commercial HVAC installation in Brice, OH. Don’t let your HVAC system fall into disrepair due to lack of maintenance. You need your heating and air conditioning units to work all the time to keep your business comfortable for your customers, clients, and employees. Quality Air Heating and Air Conditioning offers commercial HVAC maintenance in Brice, OH which includes annual tune-ups, reduced pricing, extended warranties and more. Doing this could reduce the need for repair, increase the efficiency of your system and also extend its operating life. Call us today to find out more. Do you need heat pump repair in Brice, OH? Are you curious about heat pumps and want to learn if one is a good option for your home? Quality Air Heating and Air Conditioning is the place to call and one of our heat pump experts can talk with you about our comprehensive heat pumps service in Brice, OH. We can help you find a new heat pump if yours isn’t working anymore and we can also talk with you about switching from your current setup to a heat pump. Furnaces are still one of the most common heating systems in the country because of their reliability and their efficiency. If your furnace is making any new noises or if it is blowing cool air, call Quality Air Heating and Air Conditioning for furnace repair in Brice, OH. We also offer installation services for all types of furnaces including electric, gas, and propane systems. Contact us today for more information.